Michael Ian Black now in "Michael and Michael Have Issues"
In real life? Black is uncomfortable with "sincerity"
(CNN) -- Michael Ian Black has a fine sense of the absurd. 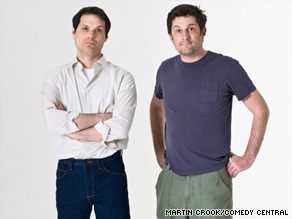 Michael Ian Black, left, and Michael Showalter have "Issues" in their new Comedy Central show. You can hear it in the comedian's deadpan delivery, which makes some of his serious musings sound like jokes -- and some of his jokes sound like serious philosophizing. You can see it reflected in his VH1 "I Love the ..." guest spots, in which he acts as if the most ridiculous pop cultural events are worthy of solemn commentary. The absurdity is also obvious in his new Comedy Central show, "Michael and Michael Have Issues," in which he and pal Michael Showalter -- the two go back to the early-'90s troupe The State -- play exaggerated versions of themselves doing such things as competing for the attention of an intern and torturing a reporter as they make a TV show. "Well the first episode has aired, and it was a HUGE HIT!!! (Except for the fact that not enough people watched it)," he wrote on the "Michael and Michael" site. "Yes, once again Showalter and myself have produced a show which America has yet to discover." America may catch on yet, thanks to Black's determined publicity tour. He talked to CNN.com about the origins of "Michael and Michael," the comedy of discomfort and the "Jack Benny Projection Theorem." The following is an edited version of the interview. CNN: How did the show come about? Michael Ian Black: The last show [Showalter and I] did together was called "Stella," which was also on Comedy Central. After that, I talked to Comedy Central about doing a different show, and they said sure. I brought on Michael to help me make it. We made that pilot, it didn't go, but when it was done, they said, "We'd still like you guys to do something." So we started pitching around ideas, and this is the one that stuck. CNN: Does Comedy Central keep a hands-off attitude with you guys? Black: Yes and no. They definitely trust us to a certain extent. We've had a long relationship with them, so they have a lot of faith in us. ... At the same time, they're a television network, and I don't know if you're familiar with television networks, but they definitely have opinions. CNN: They like to provide notes, I've heard. Black: Yes, that's exactly right. So they've given us lots and lots of notes. CNN: One thing that always strikes me about you guys is that you like the comedy of discomfort, [as in] the kind of thing that makes you laugh but makes you squirm a little bit? Black: When phrased that way, then yes, I suppose we do like that. There's something very funny to both Michael and myself about putting yourself in awkward situations and revealing this banal awkwardness that kind of happens to everybody. CNN: What makes you uncomfortable in real life? Black: I'm very uncomfortable with sincerity. (laughs) Anybody who's being sincere about stuff gives me the icks. I just invented a term: "gives me the icks." CNN: Who did you follow when you were growing up? Black: The comedians who I always really looked up to when I was a kid were John Belushi, George Carlin, Richard Pryor, Eddie Murphy ... but for different reasons. I can't say I'm particularly like any of them, but I've always responded to comedy that doesn't point itself as being comedy. ... That's where that straight-faced thing comes from. You're telling the joke without telling people you're telling the joke. You have to trust that they're going to get it. CNN: How about Jack Benny? He was always marvelous at being able to stand off to the side. Black: I think what was great about Jack Benny or anybody who sort of does that kind of thing -- that deadpan thing -- is you're allowing the audience to project their thoughts on to you. So you think you understand what Jack Benny's thinking ... but it's because it's what you're thinking. And what you're thinking is funny, and that's what makes you laugh. Does that make sense? Black: It's a theory I just made up. I feel really, really good about it. ... I'm gonna call it the "Jack Benny Projection Theorem." CNN: What do you think you'd be doing if it weren't for comedy? Black: Well, I don't know what recycled cans go for these days, but I suspect I'd be in that industry. CNN: Does "Michael and Michael" look like it will be renewed? Black: We just premiered last week, and it's just too early to know whether we'll come back or not. We've been fortunate. The press for the most part has been very good, and so now it's a ratings game and we'll wait and see how it does. CNN: You've worked consistently since the early '90s, but there's always the question of the big breakthrough. Your comedy might be too offbeat for the mainstream to get. Does that concern you? Black: Well, it certainly concerns the people who hold my mortgage. They're very concerned about it. They often say to me, "Can't you be more mainstream?" And the answer is, I don't think so. I've certainly tried. I can only be me. CNN: We're getting very philosophical here. Black: Well, that goes along with my Jack Benny Projection Theorem. CNN: Are you working on anything else? Black: I'm writing a book and I'm attempting to be a decent husband and father after not being home the last few months working on this television show. ... When you're working the kind of hours a television show requires, you don't see anybody but the people you work with. And as much as I love them, I don't love them as much as my family.